No more worrying about the group of orange and black monarch butterflies that came home with me from Rutgers Master Gardeners of Cumberland County butterfly tent exhibit that was held at the Family Success of Vineland. 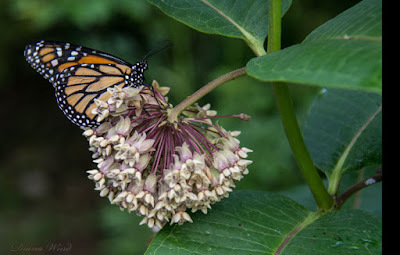 The monarchs were released into gardens full of native NJ flowering plants. Driving home with a box of butterflies on the passenger seat felt so strange. I felt a sense of responsibility to care for them properly and get them into an environment with nectar plants asap. I had no idea there were butterfly farms that shipped butterflies for events like this. Each butterfly was carefully packed into it's own special envelope that came from Florida. At the end of the Family Success event, some butterflies went home with a few of the master gardeners and eleven went home with me! Our butterflies were safely packed for travel. As I drove home, the weather report was getting worse. A severe thunder storm with heavy winds and rain was on the way in less than one hour from the time I was going to release the butterflies. How could I release tired, weak butterflies just before a bad storm? It just didn't seem right. So when I got home I put an ice pack in the box to keep the temperature cool to keep the butterflies calm and somewhat dormant. The box was a special one from the butterfly farm; the ice pack did not touch the butterflies; no worries, they didn't get hurt or frozen. When the storm passed, I took the butterfly box outside and released them, one-at-a-time, onto a weedy plant next to our front porch. It was too dark to take them to the milkweed patch. They were all alive, but looked tired as they crawled out of their envelopes. One panicked and went flying towards the porch light. Another fluttered onto the concrete porch. We quickly turned off the light. They calmed down and rested. First thing in the morning, I rushed outside to look for them. I noticed four butterflies were still on the plant where I put them. They appeared weak. I carefully picked them up and moved them to their favorite, fragrant milkweed. The blooms and leaves were still wet from the rain the night before; the sky overhead was clear and blue. A beautiful butterfly day. 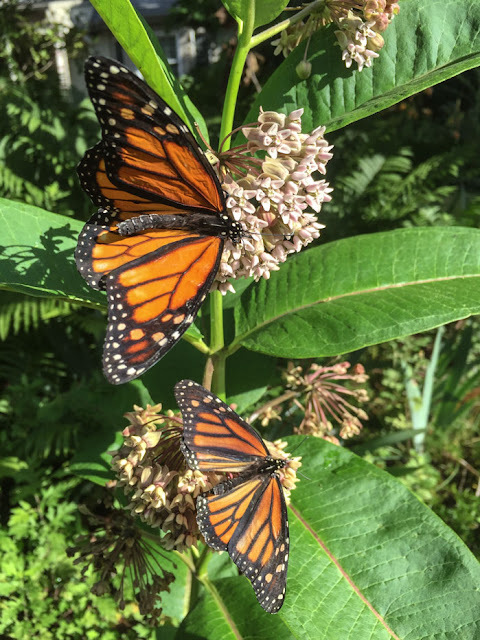 Master Gardeners: Patti Sheppard, Pam Burton, and Jan LoBiondo will be pleased to know that all the monarchs survived and are soaring in our sunny gardens. We've been watching them all day visit their favorite nectar sources, especially the native, common milkweed and echinacea. Every home owner should consider planting a milkweed patch just for the monarchs, especially since milkweed is the only plant they lay eggs on. 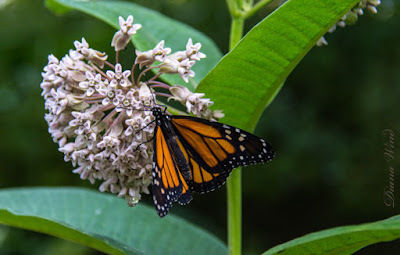 The milkweed swayed from side to side from the warm breeze - occasionally a butterfly lost their grip and fell to the grassy ground, but don't worry. Each time they fell off the blooms, we repeatedly picked them up and put back. They slurped the nectar and started moving their wings back and forth. You could see their energy improving from the sweet nectar. As the morning sun warmed their wings and their bodies got nourishment from the nectar they flew up towards the sky and into the nearby Tulip tree. Some soared over the pivot hedge and glided past groups of colorful daylilies and yellow rudbeckias to land on the bright pink echinacea. Thanks Family Success of Vineland for hosting such a fun and interesting exhibit. Families who visited the butterfly tent learned how to tell a male from a female and about a butterfly's life cycle - from laying eggs that hatch into larva (caterpillars) through their transition to a pale green capsule called a chrysalis. And, about how butterflies emerge from the chrysalis when they are ready to fly. Truly a fascinating and beautiful insect. Did you know monarchs are diminishing each year? For incredible coverage of monarch's 2,000 mile migration that takes several butterfly generations to make to their destination in Mexico, check out an amazing video by PBS called The Incredible Journey of the Butterflies. Sadly, the amount of monarchs we see are decreasing due to loss of habitat in the US and Mexico because individuals and businesses want money from chopping down the trees in Mexico where the monarchs huddle. Other major reasons include the use of insecticides like Bacillus thuringiensis (bt)* used on genetically modified corn (butterflies fly over corn fields and the pollen can kill them when they get close). Also, there are less and less common Milkweed plants in the US and elsewhere due to construction and housing. Monarchs need milkweed to survive. 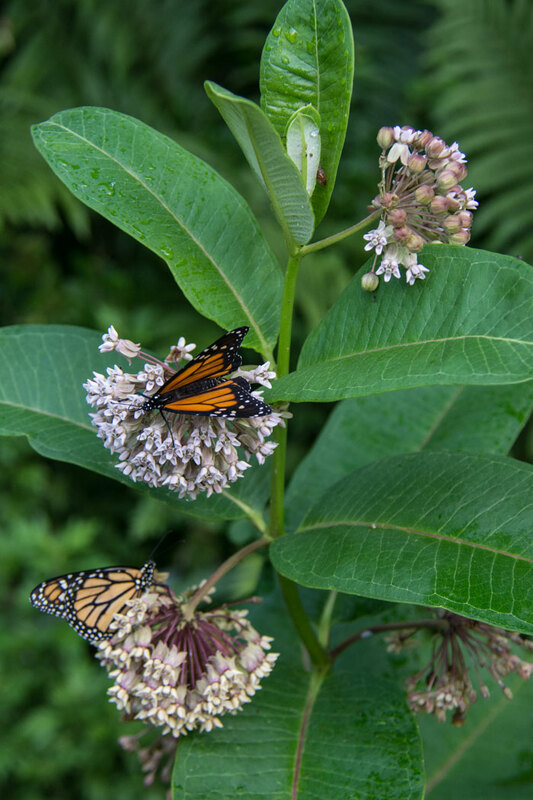 If you plan on making a spot in your yard for a butterfly garden, don't forget to plant milkweed. And remember, when the milkweed dies at the end of the season, leave it there - it may have butterfly eggs on it! Photos, Videos and blog post Copyright (C)Wind. All rights reserved.